Clear and black crystals form a Zebra pattern on one of these animal print pens. 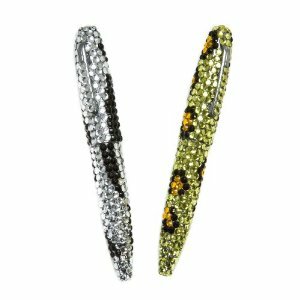 The other pen features a Leopard print in gold and black with yellow crystals surrounding the spots. The crystals on these pens are attached by hand and wear well with light to regular use. Aggressive use to this pen may cause the crystals to fall off. The pens have black ink that can easily be replaced. (replacement ink not included.) What a great teacher’s gift!